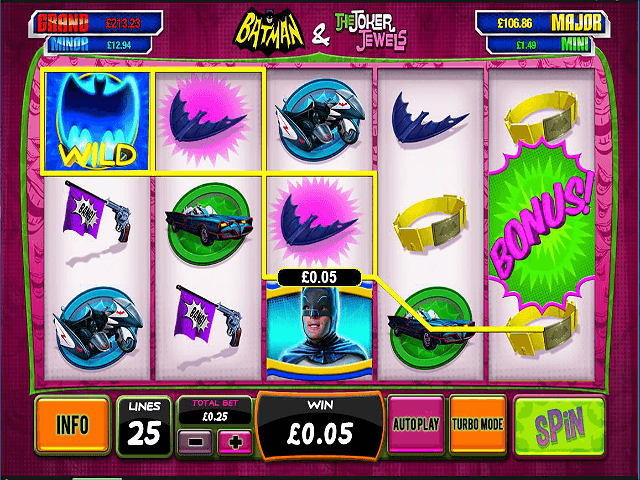 Batman and Robin are back in action as the crime-fighting duo take on the Joker in this slot from Playtech. 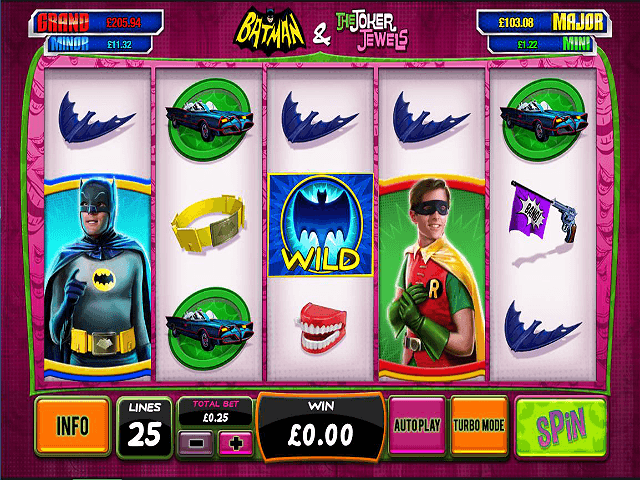 Based on the 1960s Batman TV series and featuring several characters and images from the classic show, Batman and the Joker Jewels is part of the DC Super Heroes series of slot games produced by Playtech. This jackpot slot comes with two bonus features as well as a progressive jackpot, and this review will give you all the information you need to join Batman and Robin in their fight against the Clown Prince of Crime! Play Batman and the Joker Jewels for Real Money! 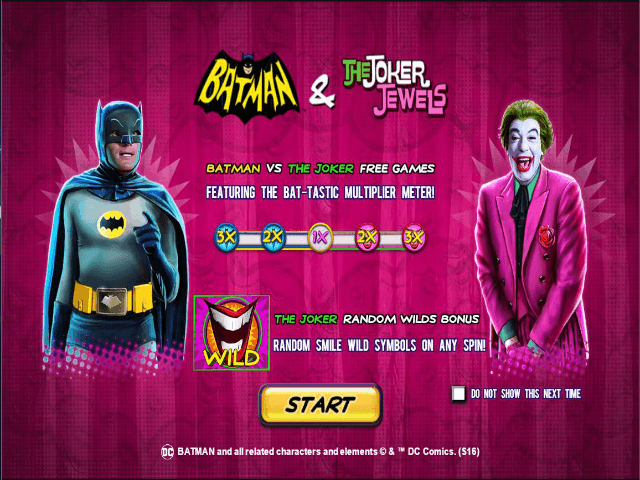 Batman and the Joker Jewels is a five-reel, 25-payline slot with similar graphics to the other old-school Batman slots in the DC Super Heroes series like the Penguin Prize and the Riddler Riches. With stakes ranging from 1p to £20, the game can be played for anywhere between 25p and £125 per spin, but the more players wager, the greater their chance of bagging a jackpot prize. You can also use the autoplay function which can be set for up to 99 games, while turbo mode creates even faster gameplay. Just sit back and watch those reels spinning. Symbols on the reels include the two main characters, as well as the Batmobile, Batplane and the Joker’s chattering teeth. There are two Wild symbols in this game – the Joker Smile and the Batman logo – which substitute for all symbols except the scatter, and these are also the highest-value symbols. If you’re lucky enough to land five on a payline, you’ll be paid 100 times your stake. There are two bonus features in Batman and the Joker Jewels. 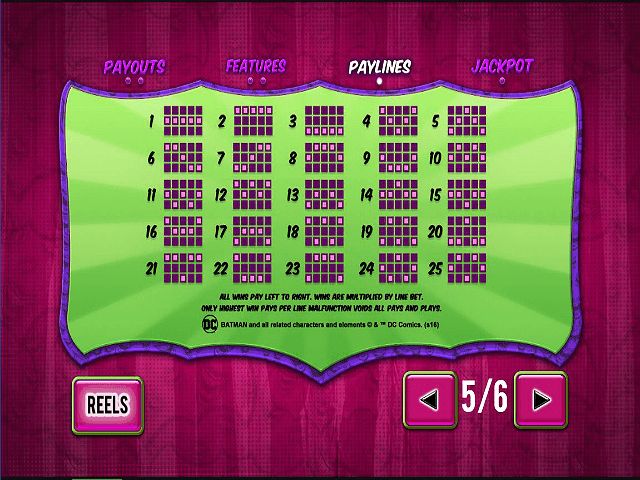 The Batman vs The Joker Free Game is activated when you get the green bonus symbol simultaneously on reels one, three and five. You’ll then see a multiplier meter with two ends and will have to pick either Batman or the Joker to extend their side of it to 5x. The Wild symbols move the multiplier meter one step to the left or right. There’s no limit on free spins during this feature as the game ends when you reach the end at either side of the meter. There’s also The Joker Random Wilds feature which can be unlocked on any spin in the main game. You’ll know when you’ve unlocked it because the Joker will appear on screen cackling away. The laugh may be evil but his antics can add up to nine Joker Smile Wilds in the mix, increasing your chances of hitting a payline. As this is part of the DC Super Heroes series of slot games, you have the chance to enter the DC Super Heroes Jackpot. Any spin of any amount can trigger the jackpot game, where you can win the mini, minor, major or grand jackpot. The size of each pot is displayed at the top of the screen during the game, and your own betting will add to each one. Share this Batman and the Joker Jewels Review today! 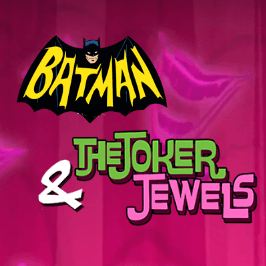 If you like Batman and the Joker Jewels, you'll love these slot titles too!